As widely expected , the beneficial boost to the Turkish Lira from yesterday's emergency 3% hike in the late liquidity window rate by the Turkish Central Bank did not even last one full day, and on Thursday the Turkish Lira collapse resumed, with the currency reversing much of yesterday's gains, sliding as much as 3.5% - the biggest decline across Emerging Markets - amid the previously discussed concerns that the rate hike will provide only temporary support. The central bank acted after three weeks of turbulence in the currency market, with the lira rallying 2 percent by the end of Wednesday, although as of this morning those gains are now lost, and judging by the chart below, Erdogan's demand that Turks not exchange their rapidly devaluing currency into dollars and other foreign currency has made them do just that. Additionally, as Bloomberg's Stephen Kirkland notes, the market is about to test president Erdogan's vow not to intervene in monetary policy: "beyond fueling the debate over whether Turkey's 300bp was enough, today's lira about-face also tests the central bank's tightening resolve, as well as Erdogan's vow of allegiance to global principles of monetary policy." It's still early going for Turkey's topsy-turvy market and the next catalyst comes from Erdogan himself, as he kicks off his re-election campaign today. Key to stabilizing the lira will be his tone and whether he sticks to yesterday's script, especially since his past comments involved blaming higher rates for inflation and accusing speculators of attacking the economy. President Recep Tayyip Erdogan, who’s seeking re-election in a June 24 vote, didn’t specifically mention the rate increase in a televised speech Wednesday, but sought to reassure investors by pledging allegiance to global principles on monetary policy. He’s due to kick off a campaign for re-election on Thursday, as polls suggest he may face a tougher challenge than in the past. Until then, trader nerves will be on frayed: "Is lira weakness avoidable? Perhaps not so much, considering Turkey’s high inflation and large external financing needs,” said Emre Akcakmak, a Dubai-based portfolio adviser at East Capital International. 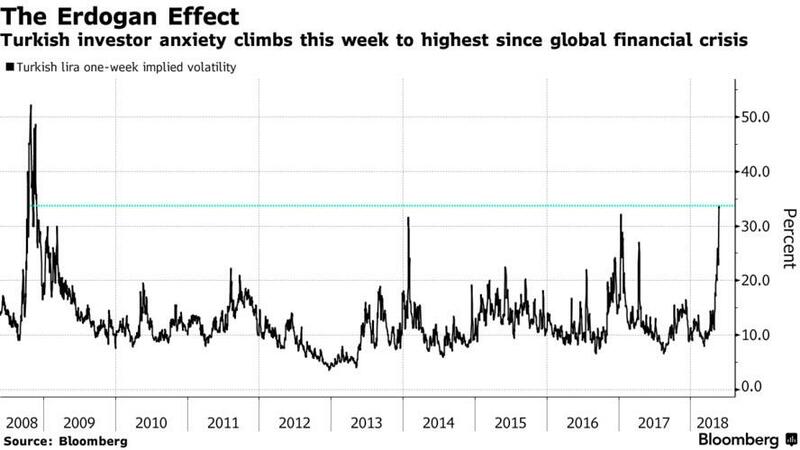 As shown in the chart below, this trade jitteriness has manifested in the biggest surge in TRY implied vol since the financial crisis. Potentially adding to the confusion, Bloomberg's Anchalee Worrachate writes this morning that "whispers of capital controls have re-emerged", as "Turkey's currency dilemma may be deja vu all over again for investors wary of the fraught history of capital controls." Back in September 1998, Malaysia's measures to counter outflows and fix the exchange rate drew criticism from the IMF. But Paul Krugman supported it, writing in a Fortune magazine article that "currency controls are a risky, stopgap measure, but some gaps desperately need to be stopped." I'm not suggesting capital controls are even an option for Turkey. Yet the judgment by some that yesterday's rate hike was a temporary fix -- particularly as the lira resumes weakness today -- underscores the need for measures to give policy makers breathing room on the currency. Meanwhile, as we summarized yesterday, analyst remain skeptical the one-off intervention by the CBRT will be successful: The rate increase “won’t trigger a sustainable reversal in USD/TRY after confidence has been shattered over the past few weeks,” said Piotr Matys, an EM FX strategist at Rabobank in London. "More is required to restore confidence among investors and the central bank may have to tighten monetary policy further perhaps as soon as on June 7." The good news is that while the currency rout has returned, so far it has spared other Turkish assets as stocks and bonds rallied. The yield on Turkish 10-year debt dropped 23bps to 14.04%, the lowest level since May 14, bringing it’s three-day decline to 54 basis points. The benchmark Borsa Istanbul 100 Index rose 1.4 percent, led Akbank and Turkiye Garanti Bankasi. "More signals may be needed, otherwise the adjustment higher in USDTRY remains inevitable"
"The positive impact will only last if the CB continues to pursue a hawkish policy; a one-off will not change sentiment except in the short term"
"Without more concrete and sustained signs of central bank commitment to bringing down inflation, the Turkish currency will likely remain under pressure going forward"
“We would maintain a bearish view on the currency over time unless there are more sustained actions"